I decided I wanted to make bookshelves in our living room. On one of our stranger walls. 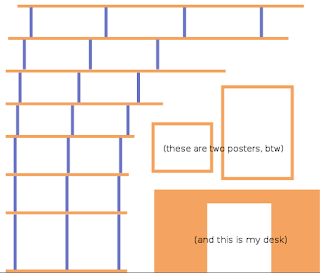 It is 1 m wide, 3 m high and after 1.5 m up it slowly starts to extend to the right, over our desk and maps. As I like to make stuff as cheap as possible while still looking awesome, I started with sourcing cheap wood. Since a few years, hipsters in Amsterdam are being 'creative' with scaffolding planks ("steigerplanken"), which come in lengths up to 3 m with a fixed width of a little less than 20 cm and which are generally made of spruce ("vuren") or pine ("grenen"). 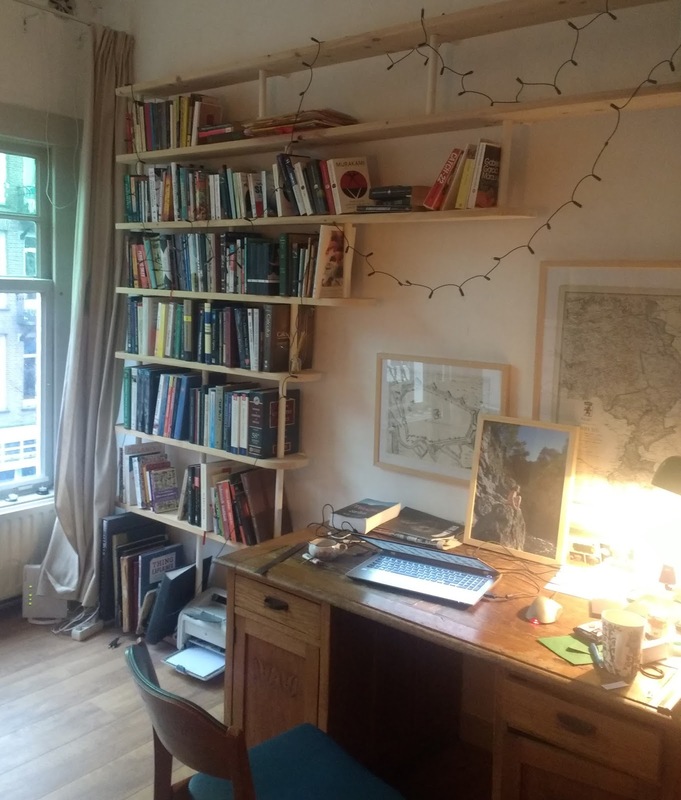 This'd make great wood for the book shelves, although the 20 cm (actually 18~19) is a bit shallow for the books I have (average depth of around 25 cm with outliers to over 35 cm). Therefore I decided to mount the shelves hanging off the wall by around 5 cm. 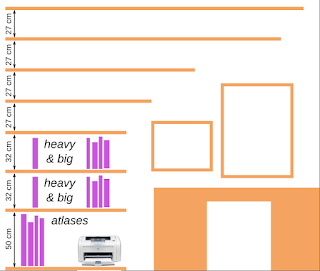 That would cover the depth of most of the books and with the biggest atlases standing on the lowest shelf, that'd be well-sized. These 5 cm spacers are connected to both the wall and the shelves. Into the pillars, you only need to drill holes for dowel pins, since they connect the pillars to the shelves. 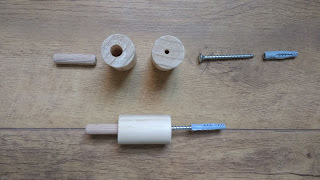 The shelves are only ~3 cm thick and we need to allow the dowel pins to go in from both sides, so I allow them to go into the shelves only for 1 cm, and since I have 4 cm long pins, I drill 10 mm holes into the center of both pillar ends of 3 cm deep. 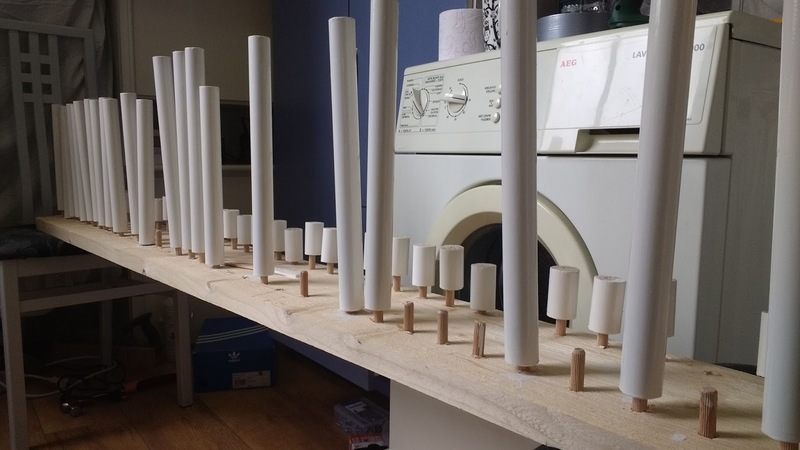 Using the dowel holes in both pillars and spacers, I mount them upright on a painting rig, that I made from a leftover piece of wood, into which I drilled 1 cm deep 10 mm holes. This made painting a lot easier! You guess what comes next? Painting. Make it any color you like - I liked to paint it the color of the wall. For the spacers I'd definitely recommend going for the same color as the wall, since it makes the whole structure blend into the wall, giving a nice floating-effect. 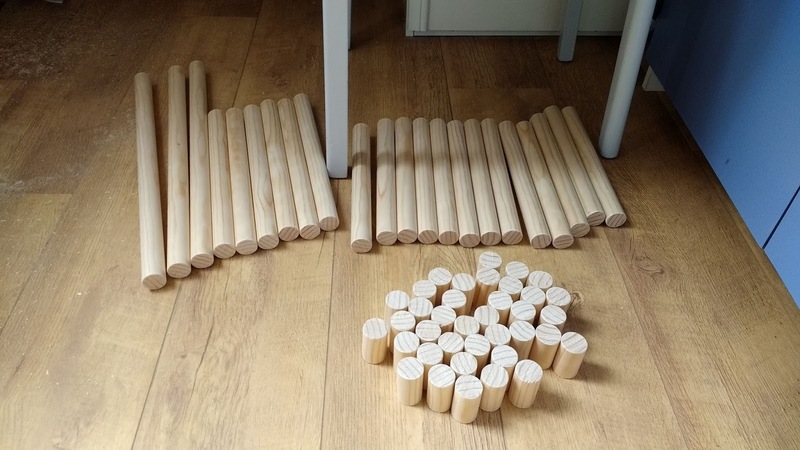 I don't think this needs a lot of explanation, but here goes: Saw the planks into the desired lengths, round them off if you want, sand them down and if you like: paint them (I didn't). 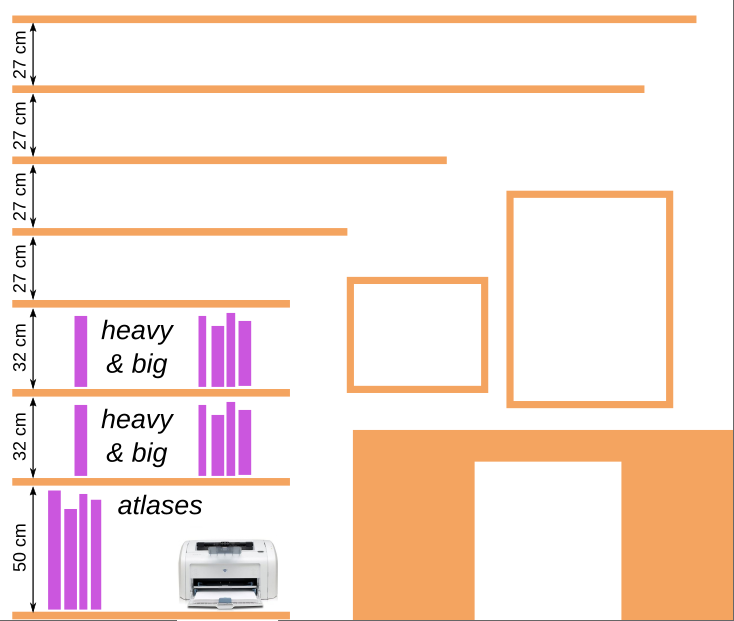 Then, from the schematic shelf diagram in one of the pictures above, decide where your pillars need to be placed on the shelves. If you have all the pillars at the same spots, you will have all pillars attached to the shelves from both sides, and on those spots you drill 10 mm holes all the way through. If you're going wild with the design (are you?) you might have spots where a pillar is attached to the shelve from only one side. There you can drill 10 mm holes of 1.5 cm deep. Then, also cut 10 mm dowel holes on the "wall edge" of the shelves, around 2.5 cm deep, the same amount as you have pillars on either side. Now get some coffee! I highly recommend to get someone to help you in this step, especially if you need to mount long shelves (> 1.5~2 m). Not so much for the weight, but more for the precision you need to get all the dowel pins into the holes at the same time. 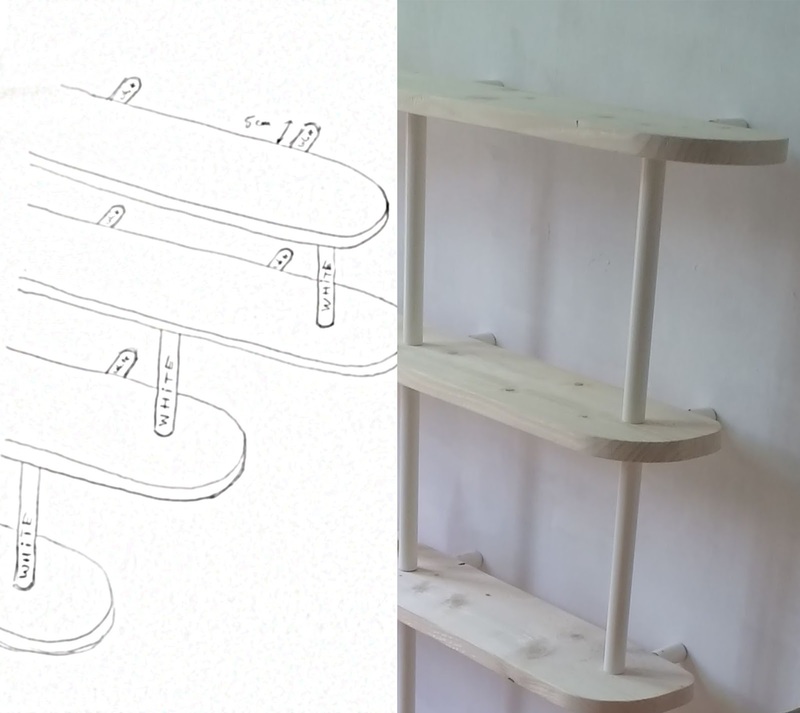 These shelves can be mounted quite easily: Bottom up. Start by laying the bottom shelf on the ground (I attached it to the wall after construction, just for safety), put wood glue in the dowel pin holes, insert dowel pin and put the right pillars in place and insert dowel pins on top. 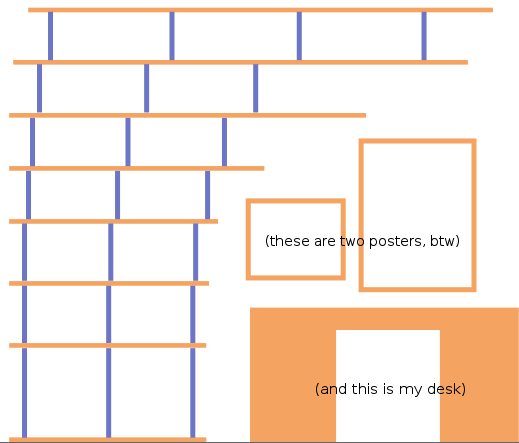 Then, lay the next shelf on the pillars and mark the location where you should put the spacers to the wall. Remove the shelf and lay it aside. Attach the spacers to the wall by drilling holes in the wall that hold your plugs (in my case 6 mm), insert plug, insert the screw through the spacer and screw the spacer into the plug using the screw and a screw drill with extended-length bit. Put glue inside spacer and insert dowel pin into spacer. You are now in the situation where you have dowel pins "sticking out of the wall" at a 5 cm distance from the wall and dowel pins pointing up into the air. Put glue on top of the vertical dowel pins and inside the edge-holes that go over the horizontal dowel pins. Position the shelf onto the dowels and press down and towards the wall to mount the shelf. 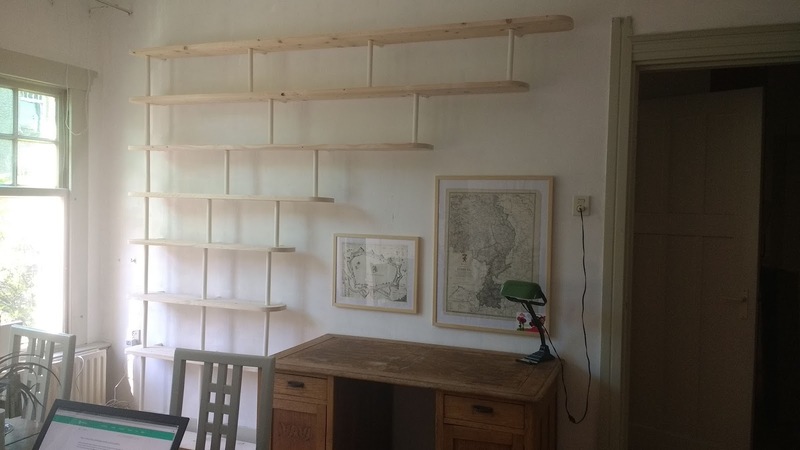 To correct for mistakes in height, I made use of my imperfections in drilling holes into the spacers: by turning them around, I could adjust the height of the back edge of each shelf! Weirdly enough, my inaccuracies in drilling really gave me optimal positioning capabilities of the shelves. So, last week I ordered a freeDSP kit, assembled it and tried to program it on an Ubuntu machine using the freeUSBi programmer. I couldn't get this to work, so I switched from the freeUSBi programmer to an Arduino micro. Since I now finally got it to work, I'll share my experiences and what I find the easiest way to work with Linux and freeDSP. Arduino IDE (install the latest version from arduino.cc)Virtualbox (install the latest version from virtualbox.org)Install Windows 7 inside VirtualboxInstall SigmaStudio inside Windows 7 (from analog.com) Before getting started, please read the Getting started manual created by the freeDSP people. Most of the information I got from there, with some tweaks to get it working from Ubuntu.